CARRY MORE SHELLS: Built to carry up to 5 boxes of shells! 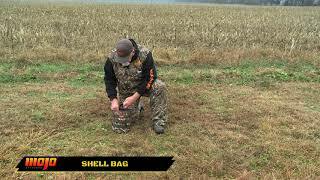 The MOJO® Shell Bag was crafted with a durable water resistant material in the Mossy Oak® BLADES camo, maximizing comfort and convenience. Holds approximately 4-5 boxes of shells and has a wired top lip for easy opening and closing. Built in hooks make this ideal for hanging on the blind or waders. + Store 4-5 boxes of shells!